Welcome back for my translation of GM Sergey Shipov’s commentary on round seven of the Dortmund tournament! Going into this round the standings at the top read Ponomariov – 4; Liem – 3Â½; Kramnik and Mamedyarov – 3. Shipov is commenting today on what would normally be the marquee matchup of the tournament: Kramnik versus Ponomariov. Somewhat surprisingly, this is shaping up as a must-win game for Kramnik. First, he has White, so this is his best chance to beat Ponomariov. If he doesn’t, then he will be a full point behind with three rounds to play, and it’s hard to imagine him catching up. If Kramnik does beat Ponomariov, then of course the tournament will be absolutely wide open — there’s no telling who will win. Hello, dear friends! As Crestbook’s resident expert, I am glad to offer my next online commentary for your attention. The events at the tournament in Dortmund are entering the deciding phase. Today, in my opinion, we will see an exceptionally important game. If Kramnik wants to win the tournament, he must defeat the leader here and now. Otherwise it will be almost impossible to catch up to him. A second important point: Kramnik lost to Ponomariov in the first round, so today he must take his revenge. To lose the mini-match, even though it is just a circumstance with no independent meaning, would still be undesirable. Kramnik, V. — Ponomariov, R.
The first interesting moment. Ruslan avoids his favorite (in recent times) Grunfeld Defense. Vladimir probably prepared for the move 2. … g6 this morning. Now that preparation is buried in the sand. In essence, a waiting move. Introduced into practice by Viktor Korchnoi five years ago. On 8. Nc3 Black is prepared to play the standard answer, 8. … Ne4! In case of 7. … d5 8. cd ed 9. Nc3 a structure has arisen in which the plans of both sides have been known for half a century. In general Black does not have big problems, but it is not simple for him to achieve full equality. On 7. … Na6 White is prepared to play 8. Ne5! Bxg2 9. Kxg2, after which Black should not drive the impudent knight out of the center with 9. … d6 because of 10. Nc6 — I remember this from the game S. Shipov – N. Nikcevic, in Athens 1997. But if that is the case, then White will have time to play e2-e4, achieving a serious space advantage. OnÂ 7. … c5, as you can easily guess, White intends 8. d5 ed 9. Nh4 with a strong initiative for White on the white squares. Also, 7. … Qc8 is sometimes seen. After 8. Bg5 h6 9. 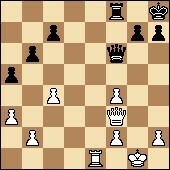 Bxf6 Bxf6 10. e4, Black is placing his hopes on the advantage of the two bishops. However, it is not so easy for them to get enough room to operate. Yet another clever twist. The White knight remains in seclusion on b1. The usefulness of the move … a7-a5 can be clearly seen in the variation 8. Nc3 Ne4 9. Qc2 Nxc3 10. Ng5 Bxg5 11. 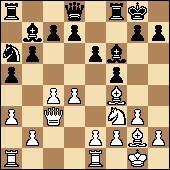 Bxb7 — as you see, the Black rook can now escape to a7. For that reason Black does not lose an exchange. In contemporary practice, the moves 8. Bf4 and 8. Nbd2 are both popular. A novelty! This move looks clumsy, because the knight on a6 is very limited. But on the other hand, Black completes his development, for better or for worse, and is well prepared for pawn collisions in the center. His desire to play with an abundance of solidity is now evident. It will remain a mystery why Kramnik avoided the typical move 9. Ne5. I will offer the following version: 9. … Bxg2 10. Kxg2 c5!? 11. d5 Qc7 with interesting and, most importantly, nonstandard complications. It’s not impossible that Black might get good queenside counterplay in this variation. Play might continue 12. Nf3 (12. Bf4 Bd6!) 12. … ed 13. cd b5! and so on. Of course. It would be like death to allow e2-e4. Ponomariov in turn plays circumspectly. The natural move 10. … f5 would lead to unpleasant consequences after 11. Nd2! The only way to continue the battle for the key square e4. A mechanical blockade with 11. 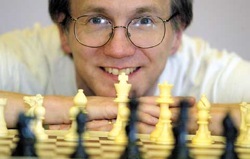 … Be4 does not offer good prospects, because White will soon play the well-known maneuver Bg2-f1! and Nf3-d2, forcing the enemy bishop away from e4. It’s useful to bring the queen rook toward the center. Here is an interesting moment. Ruslan is preparing a route for his tightrope-walking knight to get from a6 to e4. And Vladimir somewhat unexpectedly ignores the threat! 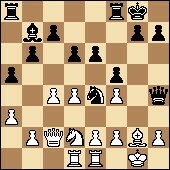 He could have left the Black knight in its sad position on a6 by playing 13. Qe3 or 13. b4. It seems to me that White has the advantage in either case. Too late! The bishop on f6 has already completed its mission. Ponomariov insists on exchanging on his own terms. Kramnik resists! It’s easy to understand. The opening advantage is trickling out of his hands like water. After 16. Bxf6 Qxf6 Black’s position would be in perfect shape. A precise answer. The exchanges 16. … de 17. Nxe4 fe 18. de Qe7 19. ef Qxf6 20. e3 would lead to an unpleasant position for Black. The pawn on e4 is weak and the d file belongs to White. Sensing the uncertainty of his opponent, Ponomariov turns up the pressure. Black has chances to develop an initiative on the kingside while the main White forces are languishing to no purpose behind a wall of pawns. The clock indicates 0:45 – 0:58. It’s useful to exchange off the bishop on g2–the only capable defender of the White king. Weaker would be 19. … fe because of 20. e3. The queen is prepared to take the place of the fallen bishop in defending the monarch. The position is opening up and Black’s rooks have lots of space to roam around. Meanwhile, the White rooks as before are doing nothing. Too mild, under the circumstances, would be 21. … Qxf4 22. Qxf4 Rxf4 23. f3 with equality. Meanwhile, 21. … Rxf4 would simply hang a rook after 22. Qxa8+. Of course, White must not give away the f4 pawn without a fight. A powerful blow. The weight of the Black rooks descends on the White center. Vladimir, at this point, is saying, “I don’t care how it tastes, as long as I stay alive!” But, it seems, he does have a defense. Correct. It’s useful to wake up at least one of the sleeping rooks. The queen escapes the enemy fire with a tempo. 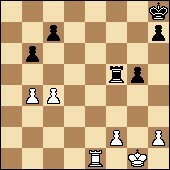 White cannot take on e5 because of the weakness of f2. One step forward, one step back. But in reality, it’s all logical. Having chased the Black king to h8 , White now has the motif of back-rank checkmates working in his favor. This is exactly the way. He offers Black a chance to trade a pair of rooks and win the pawn on f4 … and get checkmated. The cowardly 26. e4 would lead to a worse position for White after 26. … Qg5+ 27. Kh1 Qc5. Calmly and technically played. Black has enough compensation for the pawn. White has several weaknesses. It’s roughly equal! There is no shortage of time: 0:32 – 0:50. The most energetic move. No pawns–no problems. At the same time, Black creates luft for his king. A peaceful outcome is practically inevitable. Kramnik provokes a queen trade, hoping to “torture” his opponent a little in the rook endgame. Not quite! 32. 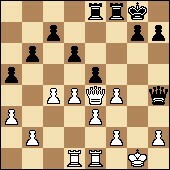 Re6 would have preserved some practical chances, with the idea of transferring the rook to c6 and advancing the king. Now everything is completely simple. Of course not 33. … cb? 34. Rxb6 and Black loses a pawn. The blame for everything falls on Vladimir’s carelessness in the opening. He should not have allowed his opponent to activate the knight that was locked up on the side of the board — see the position after Black’s 12th move. That was the key, decisive moment of the battle. After that, White did not even have a shadow of an advantage. This has been grandmaster Sergey Shipov at your service, overcoming the unusual heat and difficulties with the Internet. Until tomorrow, I wish you well. Previous post: Don’t touch that h-pawn!